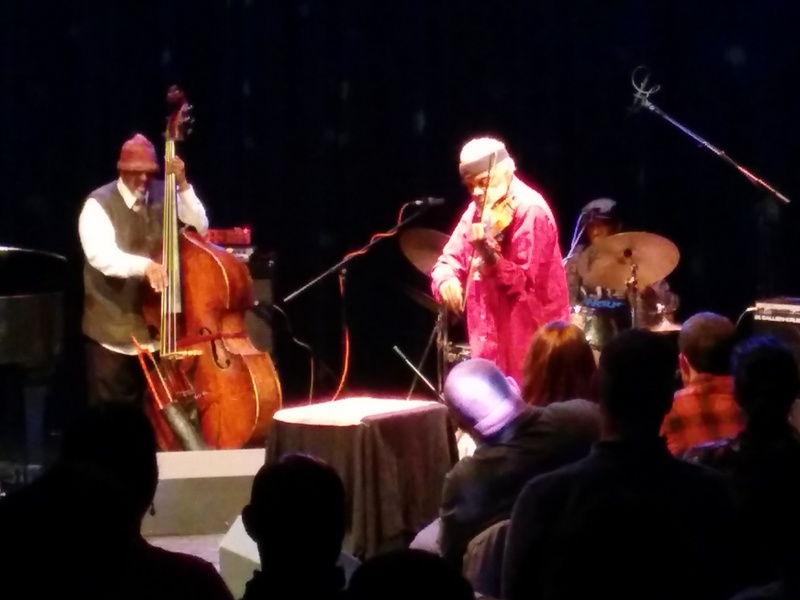 At the Painted Bride Saturday night (March 8th), five titans of improvised music gathered in honor of their friend, colleague, and mentor Cecil Taylor in anticipation of the pianist’s upcoming 85th birthday. The performance was the first of three concerts—billed as the “Still the New Thing” Festival—which saxophonist Bobby Zankel is curating. In his program notes he lauds the festival’s honorees for their “enormous contributions to the movement of expanding the harmonic, rhythmic, intervallic, [and] structural language of African American Classical Music (Jazz) and redefining what is possible.” For the “Celebrating Cecil” concert, Zankel assembled an ensemble whose individual and collective contributions could be described in the same terms. As the Painted Bride’s director, Lenny Seidman, rightly observed at the beginning of the performance, each musician is a heralded bandleader with an accomplished resume of groundbreaking work in avant-garde scenes. 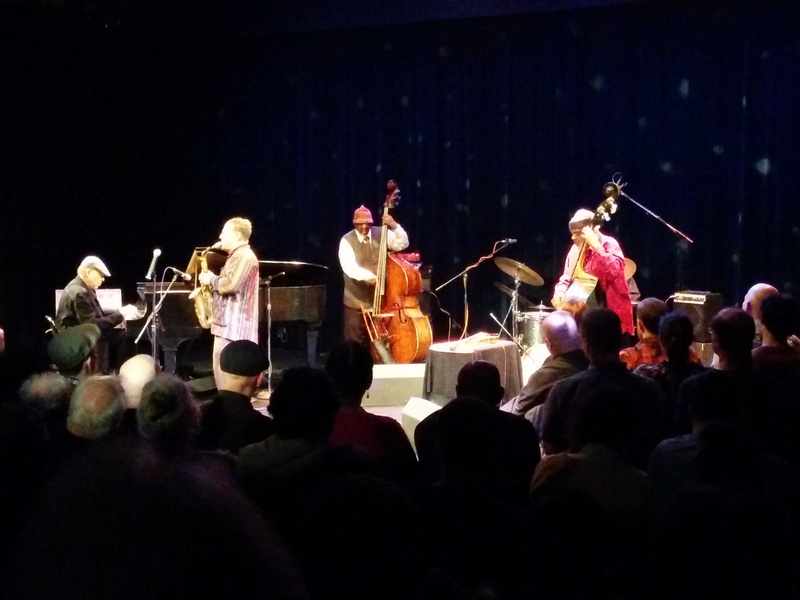 Joining Bobby Zankel onstage were Dave Burrell (piano), Henry Grimes (double-bass and violin), William Parker (double-bass), and Andrew Cyrille (drums and percussion). The concert—nearly three hours of intensely engaged music—unfolded in front of a sympathetic and attentive audience that filled the Painted Bride to capacity. (Some hopeful, last-minute concert-goers unfortunately had to be turned away.) The program consisted of extended pieces, lasting between 20 and 40 minutes, that left audience members calling out in support, amazement, and sheer delight at the high levels of musicianship and empathetic collaboration. As a recently arrived resident of the Philadelphia area (by way of New York City), this concert was my introduction to many of the city’s most dynamic players in the current improvised music scene: it was my first trip to the Painted Bride, an Ars Nova event, and, in fact, the first time I had attended a live performance by any of these musicians. Like so many others in attendance, I was happily carried away by these musicians’ enthralling and masterful performances, coming away with a deep gratitude for the virtuosic artistry the ensemble shared with us. This music is the music of emergence, possibility, and collaborative, spontaneous composition. Throughout the evening I marvelled at the frequency and depth of the confluences and resonances that arose as each member of the ensemble contributed intricate and complementary sonic lines to a complex milieu. These moments of coming together—not necessarily in unison so much as in resolution—were to me all the more compelling because everything (pitch, harmony, meter, rhythm, timbre) was in play all the time. It is to the credit of the ensemble’s members that they allowed space for these confluences to arise and be heard amid what may have seemed at times like music too dense to tease out individual lines. Of course, teasing out the individual lines is not necessarily the point: they are making music together. As if to let the audience see deeper inside the music, the ensemble followed with a deconstructed piece that featured a series of extended solos by each musician. Here, instead of the dense arrangement of multiple parts happening simultaneously, each musician contributed his part in succession. The thick blocks of sound had been broken down into their constituent parts and laid out, one after the other. The same emergent confluences from the last piece were present also; but instead of acting as thematic motives that popped up out of collective performance, the ensemble members used them as transitional elements that bridged each solo with the next. Cyrille began the piece with one of the finest drumset performances I have ever witnessed. Any description I might employ would surely come up far short of those eight, masterful minutes of music. The range of textures, musical ideas, polyrhythms, and timbres he elicited from the set was simply astounding, even, at one point showing further range by bringing all of his concentration and artistry to bear on a single ride cymbal. Parker followed showing equally comprehensive range on his instrument, strumming out overtones and chords over every centimeter of the bass’s strings. As he did throughout the night, drawing on an encyclopedic knowledge of African American vernacular music, Parker continually introduced basic rhythmic cells and grooves, on which he would elaborate, augmenting them with additional elements, phasing them in and out of time, elongating and collapsing the cell’s rhythms, and then deconstructing it completely, only to start up again with a fresh idea. One such cell served as a transitional moment to Burrell’s piano solo. Characterized by an angular lyricism, Burrell composed a lengthy improvisation via an amazing array of “common tone” modulations, in which one pitch (or a series thereof) would carry over between phrases, sometimes as chord tones in a new harmony, the start of the next melodic line, or the foundation of a rhythmic cell. His solo was punctuated with striking moments of beautiful tonal clarity and concluded with a exemplary display of improvised compositional process, as, having signaled the end of his solo to his bandmates, he then worked for several minutes more to bring his composition to an end via a single line emerging from a cacophonous rumble and flying up the length of the keyboard. Burrell’s final pitch was Grimes’s first, which he playfully but emphatically pulled out of his double-bass, immediately setting the instrument on the ground before adding his solo on the violin. As if to say “I hear you, but check this out,” Grimes saw Burrell’s wager and raised. Zankel followed, and concluded the piece, but not by himself. With a few lightly stroked chords, Burrell broke the soloistic vibe, and along with Grimes started to put the band and the groove back together underneath Zankel’s solo. Burrell and Cyrille showed particular skill in accompanying here as complements, counternarratives, and mimicks of Zankel’s improvisation. As they did throughout the night, Parker and Grimes also performed in a complementary fashion: where as Parker more often opted for intermittent grooves and accents, Grimes maintained a more constant and perpetual motion on his double-bass, alternating articulated lines with chordal strumming. Opening the concert’s second half, Zankel showed profound lyricism and inspired intensity through a flurry of motives, musical arcs, and timbral variations, shining with particular brilliance over what might be described as an “exploded” swing groove. In the concert’s most explicit and extended expression of swing, the band nonetheless frequently played around, in spite of, and against it, sometimes folding it back just beneath the piece’s surface before unleashing it again. Amid their own accompanying lines, the band deftly passed around Zankel’s music, as a single note or rhythmic motive would filter through the other instruments—as a chord tone in a piano harmony, the foundation of a new bass line, or an added accent in Cyrille’s percussive accompaniment. In truth, the concert featured many such moments when individual mastery was amplified and augmented through collective virtuosity, empathy, and unparalleled musicianship. A great success for all involved, the night closed triumphantly. There will be two more concerts in the Festival, both of which I highly recommended for the exemplary musicians performing, the immense value of the work the sponsoring organizations are undertaking, and the importance of supporting live, improvised music performance in Philadelphia. The second in the series will be a performance celebrating Ornette Coleman with the Denardo Coleman Group and Jamaaladeen Tacuma Band on Friday, March 21st. 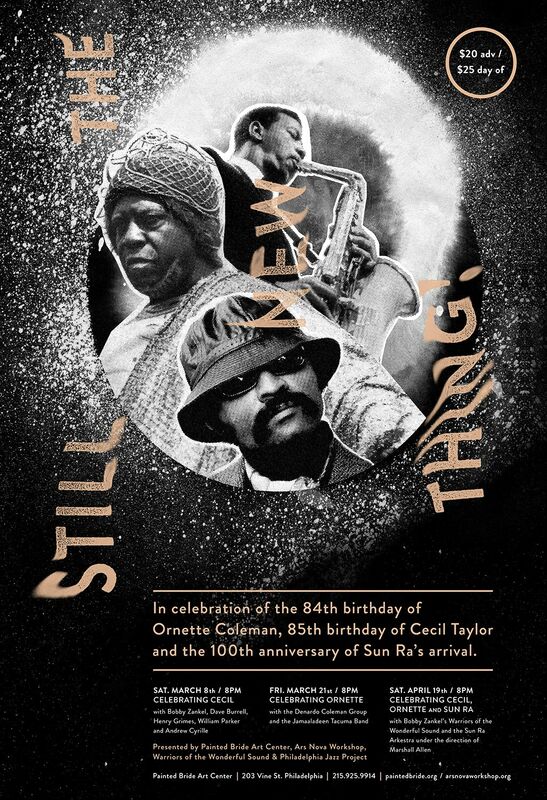 And the final concert will be in honor of Sun Ra, featuring performances by Warriors of the Wonderful Sound and the Sun Ra Arkestra (led by Marshall Allen) on Saturday, April 19. Like the Cecil Taylor date, the other two concerts are scheduled around the honorees’ birthdays and are co-sponsored by the Painted Bride, the Ars Nova Workshop, the Philadelphia Jazz Project, and Warriors of the Wonderful Sound. Tickets are $25 at the door; but there are discounts for advanced purchase and Painted Bride members. For more information, click here. This is a brilliant review of a brilliant concert. So many times the music is great and the reviews are stupid (or worse). This time a journalist rose to the occasion and actually wrote about what really happened that night. Sir, please get a job as music journalist for “The New York Times” and redeem the shoddy status of music criticism today. Hello Janet – Thank you for your kind words and encouragement! I’m glad you thought the review worthy of the concert. At present I have a wonderful job teaching at Swarthmore College, but would happily contribute to the NYT or any such publication, if they were to ask!